Everyday Young Mum: Why formula feeding doesn't make you a bad mum! Why formula feeding doesn't make you a bad mum! 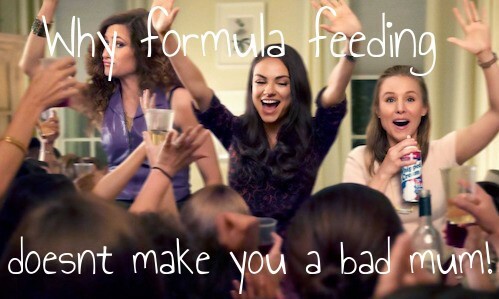 So since Cohen was 3 days old I have had to formula feed. The reasons why I will hopefully talk about in another post. From that day on wards I have been made to feel like I'm a bad mother that has failed my son. Whilst I know that breastfeeding is encouraged because 'breast is best' its not always possible for some women. I was made to feel like a failure by health professionals and other mothers. While putting your opinions across about breastfeeding stop to think about how your making the mother feel. I was gutted when I had to go and buy the first tin of formula, I genuinely felt like my body had failed my son. Some mothers aren't strong enough to cope with these types of pressure from people and it may tip a new mum over the edge. If anyone would ever like to discuss any issues they have with breastfeeding or would like to know where to get some advice. Feel free to leave a comment below or to DM me on twitter or to email me. Remember you will never be a bad mum!! Thank you for sharing <3 I wish professionals like nurses and staff (along with everyone else in the world) were more aware of how their attitudes impact their patients. I'm already unsure of how my delivery needs will be met by my current medical team. Has anyone ever outright called you a bad mother for this decision? They haven't out right called me a bad mum, but they have re-worded it so it didnt sound like they were saying that if you get what i mean. Don't worry I didnt think that at all.